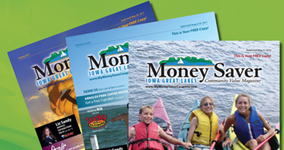 The Money Saver Magazine is a seasonal direct mail advertising magazine featuring local discount coupons and information from quality businesses in the Lakes Corridor. Shannon Dunham solely took over the helm in September 2010 to continue the vision and achieve the goals, to provide the highest quality direct mail marketing tool in this area with QUALITY printing & graphics, the best DEMOGRAPHICS, easiest WEBSITE in the field, fairest PRICE and exemplary SERVICE. Shannon also owns Arnolds Perk and is co-owner of Duke’s Burgers, both in Arnolds Park.